Winter is the best time to make memories with your friends and loved ones. The closer you are, the warmer you stay! There is no better place to come and celebrate the thrills of winter! Each community celebrates the season in their own way, but exciting activities and great ways to stay warm take place in abundance in Walworth County. Folks will be kicking off the winter celebration with a large creamy cup of hot chocolate at Burlington’s annual Hot ChocolateFest. Anything you could possibly associate with winter will be included in these three days. Break out your winter woolies to enjoy open skating on Echo Lake, ice bowling, snowman decorating contests, and broom ball. Then warm up with hot chocolate, storytelling around campfires, and a chili contest. This weekend will also include live music, a Winter Artisan Faire, and a scavenger hunt for the kids. Warm up those dancing shoes at the Old fashioned “Sock Hop”, then wrap up the weekend fun with a Pancake Breakfast on Sunday. On the shore of frozen Delavan Lake, the Community Park pavilion will resonate with the sounds of hot jazz from the Elkhorn, Big Foot and Delavan-Darien High School Jazz Bands at the Town of Delavan’s Winterfest. Food and drinks will be available to satisfy you while you purchase your 50/50 raffle tickets to help support the Delavan-Darien Arts Booster Club and the Friends of the Park. Locals and visitors alike will be excited about the door prizes; this is your chance to win season boat passes or two season non-resident passes. Make sure you take advantage of the Free Fishing Day, also on January 19th, on all state lakes and streams! Details for Winterfest and the DNR’s Free Fishing Day can be found on the Walworth County Visitors Bureau’s events calendar. For nine days, Winterfest takes over the city and the shore line of Geneva Lake in downtown Lake Geneva. Walking down Wrigley Drive you will see the infamous sculptures created for the U.S. Snow Sculpting Competition and the Ice Castles decorating the shoreline. Throughout the city, you will find a plethora of events that make up this elaborate winter celebration. Events include, but are not limited to: Hovercraft Experiences, Dinner & Dance Party, Human Dog Sled races, Souper Family Fun Night, a Food and Wine Pairing, The Supper Club Experience, Kids’ Snow Sculpting Lessons, the Winterfest Showcase, Cocoa Crawl, Chilly Jiggers Ice Fishing Derby, Helicopter Rides, the Polar Bar, Chili Cook-Off, Live Music, and Candlelight Hike. 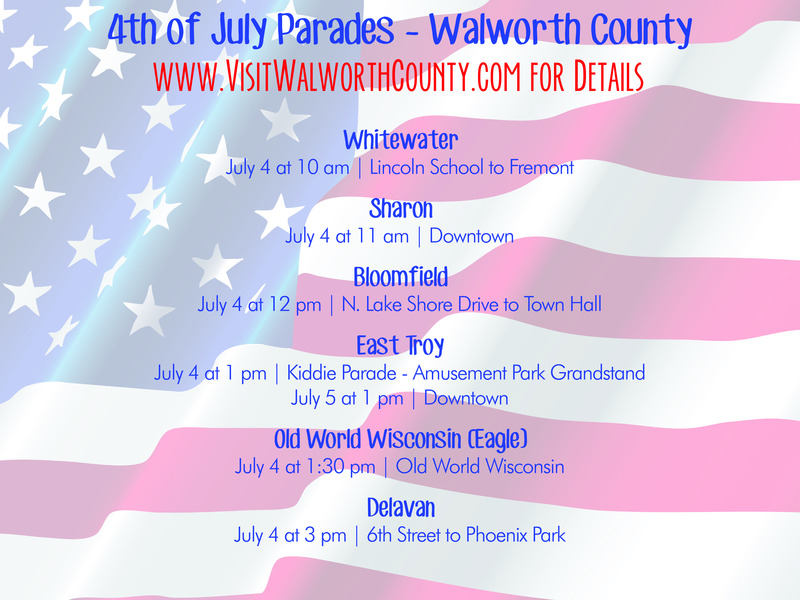 Details for all of these events can be found on the Walworth County Visitors Bureau’s events calendar. Grand Geneva’s Winter Carnival hosts skiing, snowboarding and fun snow activities for the whole family to enjoy! If you have got the skills, take part in their Ski Boarder Cross and Rail Jam competitions or just enjoy the festivities all over The Mountain Top. If you’re not a skier, relax in the Beer Tent and let the kids tackle free activities made just for them. The festivities will conclude with a beautiful fireworks display and the Torch Light Hillside Parade at 8:30 pm. Come chill out on the other side of the lake for Day in the Bay! Pick up a passport at the Barrett Memorial Library and collect your stamps as you visit Williams Bay businesses for the chance to win free raffle prizes. There will be free children’s activities at Privatos Restaurant from noon to 3 pm, with a children’s raffle at 3:30 pm. Sky Circus on Ice hosts professional kite teams from around the world to showcase their skills during this winter festival on the shore of Delavan Lake. You can only truly enjoy the awe and wonder in person. Expert snow sculptors and ice carvers will also demonstrate their skills along the shore of Lake Lawn Resort and the historic brick street in downtown Delavan. Delavan hosts one of the largest train shows in the Midwest, featuring operating layouts in multiple scales. See some of the most exciting layouts from the ‘big’ shows as well as beautiful local layouts. This is a big train show with all the comforts of the small town atmosphere. Located in the center of historic downtown Delavan. This family-friendly event has loads of fun and free admission for all! A stack of hot cakes is just not complete without a layer of maple syrup over the top! On March 17, Covenant Harbor will be serving an all-you-care-to-eat pancake breakfast and selling all sorts of maple deliciousness at Maple Fest. This festival will show all the things Covenant Harbor has to offer; explore the grounds, learn more about the family activities available, and enjoy a maple syrup tour, and much more. 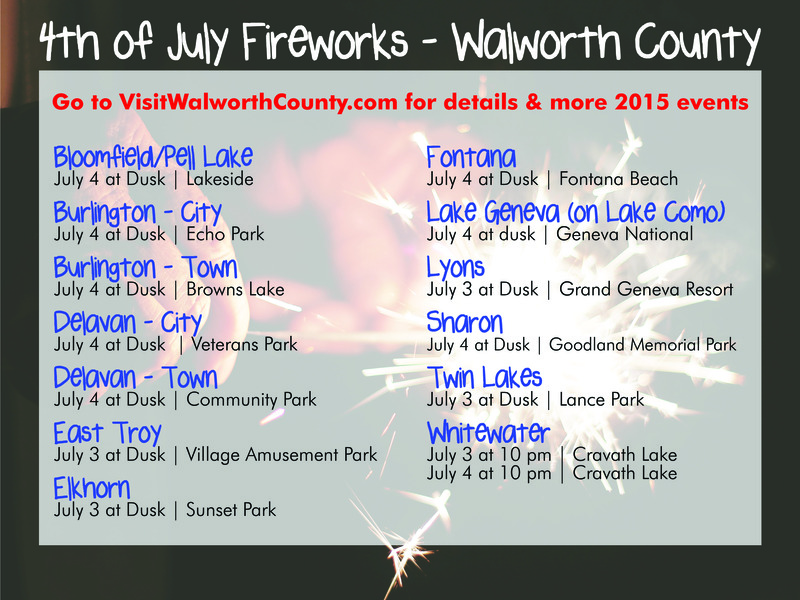 visit our events calendar at VisitWalworthCounty.com. Frolic in Fall Festival Fun! The soybeans are changing colors and the leaves on the trees are beginning to erupt with color. As we usher in the fall, we revere our harvest season and all the things we get to do in the cooler weather. Because I mean in Wisconsin, just throw on a sweater! 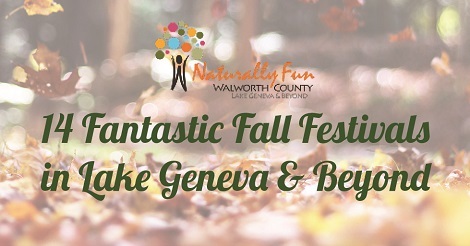 Check out all the fall fun that there is to be had in Walworth County. Darien may be small but it celebrates corn in a big way! This three-day extravaganza inaugurates the event with fireworks on Friday. On Saturday and Sunday, grab your FREE ear freshly roasted sweet corn from Birds Eye Foods and a beer to enjoy while listening to live music on the Miller Lite stage. Bring the kids to hoot and holler on carnival rides, while you explore the craft fair and support local, creative vendors. Win big at daily bingo games or at the raffle pull on Sunday. Softball, volleyball, and horseshoe tournaments bring friendly competition to the fields; come find your favorite team to root on! 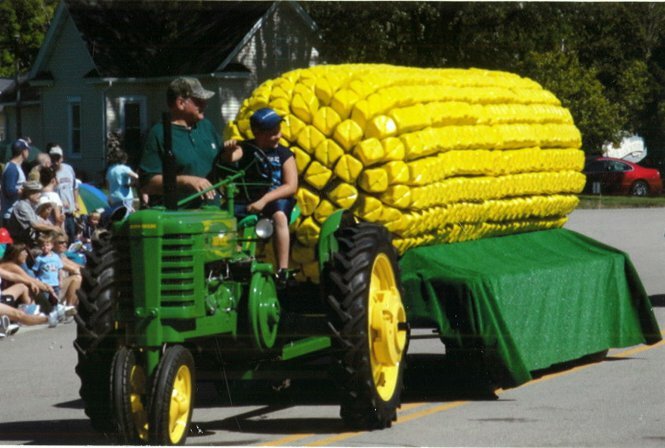 Bring your lawn chair on Sunday to watch the Cornfest Parade filled with floats, bands, tractors and horses. The sounds of bluegrass music fill East Troy’s historic village square on Saturday and Sunday with a full line-up of bluegrass bands and Fiddle, Banjo, Mandolin and Guitar contests. Enjoy great music, lots of great food and East Troy Marketplace vendors for only $10! Kids 15 & under are free!! 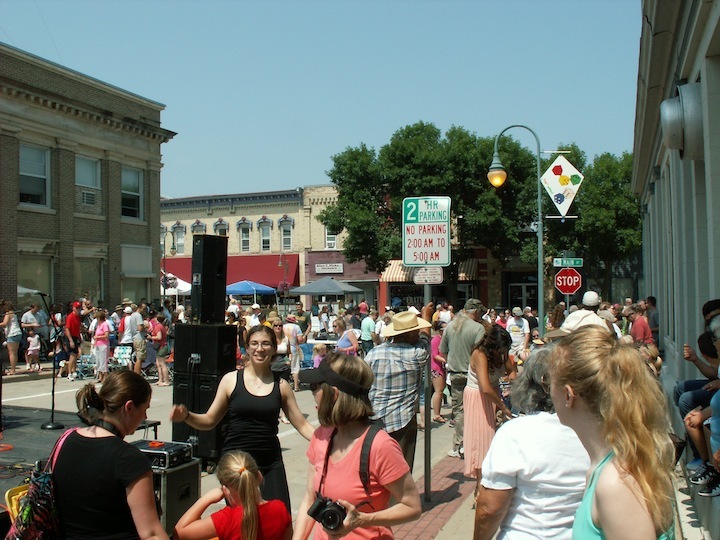 The historic architecture and natural beauty of Main Street, Whitewater, serves as the perfect backdrop for this annual event celebrating the arts. Galleries, local shops and restaurants open their doors for you to experience the many diverse forms of the arts this community supports. Proceeds from the event go to support the local arts environment in the community. Funds will help support scholarships for local high school and college students, community art programing, as well as creative improvements to the city such as public murals, mosaics and sculptures. Help support the arts by enjoying this wonderful exhibition of creativity! An annual festival tradition, Scarecrows will be “On Parade” along the historic brick road; each created by a local business or citizen with a theme and name. Come vote for your favorite scarecrow! This festival spans along the brick road and into multiple parks throughout historic downtown Delavan. Begin at Water Tower Park for the craft fair & flea market, demos by local businesses, food, and music by Cheryl Niemo & the Down Home Boys. Bring the kids to paint pumpkins, or say hello to the animals at the petting zoo at the Aram Public Library. Inspired to decorate for fall with a scarecrow at your house?? Build a Scarecrow and take it home. We’ll have the supplies to make a scarecrow and helpers. This is great for the whole family! To compliment the sidewalk sales by Delavan Merchants, the Duck Raffle (3 tickets for $5 or $2/ each) gets you a chance to win $150 or any of the wonderful prizes donated. Other activities include a narrated Walldog Wagon Tour, a pie and cake sale outside of Remember When, and the 3rd Annual Quilt Show throughout merchant store fronts. As a grand finale for the Scarecrow Festival and the season at the Phoenix Park Bandshell, Andrew Sedlak will open for the infamous Pink Freud, harmonized with vibrant laser lights by the Laser Fusion Light Show. This is a sensory wonder that you don’t want to miss! Pearce’s Farm Stand wants to thank their customers for helping them grow. Get your free cooked sweet corn (Sunday only), enjoy music, free hayrides to pumpkin patch, and dancing. Tackle their famous jumping bales with slides, tube rollers, and climb in a REAL John Deere Combine. All to be added to the regular offerings of Saturdays and Sundays like pre-picked produce, corn maze, helicopter rides (weather permitting), lookout tower and human hamster wheel! 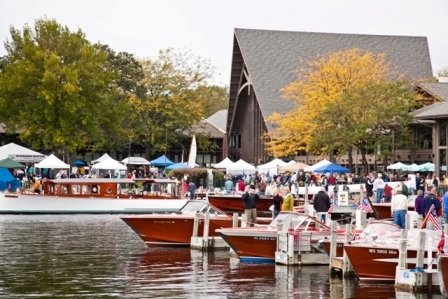 The Geneva Lakes Boat Show is an annual event held in the Abbey Resort’s harbor, presented by the Blackhawk Chapter of the Antique and Classic Boat Society. This show features over 100 classic and vintage boats from all over the country. Check out the pre-events and getaway packages available at The Abbey Resort! Celebrate the 30th year of fall fun at Apple Fest, with apple picking and hayrides through the orchard. Indulge in apple cider donuts, kettlecorn, and tastings of the Apple Barn’s award-winning fruit wines. Grab some donuts, cider or other treats to take home as you head of the door of the Country Store and Bakery. Craft vendors and a bounce house for the kids make a day filled with family fun and everlasting memories! Antique Flea Market. Rain or Shine, over 500 dealers gather inside and outside to share their wares and great deals on some great finds! Free parking and great food make this a day trip that must be had by all antiquers. 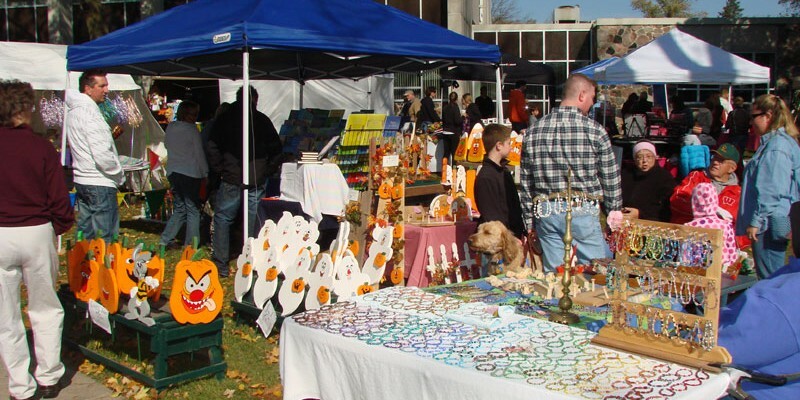 Gather at the lake to enjoy everything that Lake Lawn Resort has to offer at their Fall Family Festival. This event allows family and friends to enjoy the fall colors along with a weekend packed with fall-themed events; including unlimited mini golf, scarecrow building, pumpkin decorating, donut making, hayrides, Fall Harvest Buffet, movie nights, lots of games and activities for the whole family, and more! Activities will be open to resort guests AND the public. Overnight packages are available for three nights or two nights, and include overnight accommodations, two 140th Anniversary Celebration Beach Towels per room, Unlimited Mini Golf per person, Fall Harvest Buffet on Sunday, October 7, and one pumpkin per person. What a great reason to plan a fall getaway! Plan your weekend to stay at one of Lake Geneva’s lakeside hotels to enjoy the fall colors. 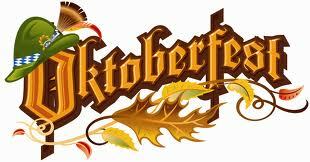 Then join the Streets of Lake Geneva for their Annual Oktoberfest Celebration! The beer tent is back this year, featuring delicious German beers from Hofbrau, as well as a few local favorites! The whole family will have a blast with bounce houses, pony rides, German music, FREE pumpkins, craft fair, cider donuts and more! This event is FREE and open to the public. Venture down to Flat Iron Park and start a new fall family tradition. Bring the whole family to Elkhorn, as they fill the town square with fall fun at the 13th Annual Elkhorn Oktoberfest in Veterans and Pocket Parks. Walk around the downtown square to see over 100 crafters and vendors showcasing handcrafted items, antiques, produce and plants, home party consultants and more. Head over to the north parking lot of the government center to see some beautiful classic cars during our 9th Annual Oktoberfest Car Show. The kids will have plenty to keep them occupied with games, pumpkin decorating, bounce house, slides and more. Grab a bite to eat from the many delicious food vendors or sample some chili in the Chili Cook-off. 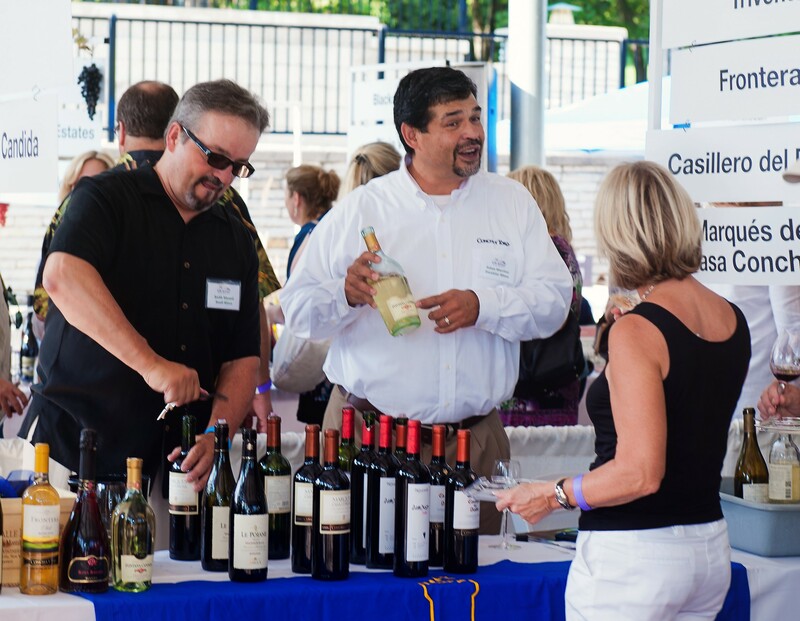 Adults get to have their fun too when you step inside the Wine & Beer Tasting tent. Enjoy all the different live entertainment acts from local groups like Toe to Toe Ballet, the Walworth County Cloggers, Elkhorn Flying Dragons, Dreams Studio of Performing Arts, and music from a live band. So much to see and do, that you’ll need to take the day to experience this fantastic event! From the outside of the pavilion, this seems like a quaint little celebration….until you walk through the door! Celebrate like the Germans do with the tastiest traditional German food like schnitzel and spätzle. Along with wine, beer, and pastries like streusel. No need to worry about the calorie count, because you’ll be up dancing to some festive polka by the Steve Meisner Band. Come and experience Gemütlichkeit in Delavan! This is going to be the best Halloween party in town! 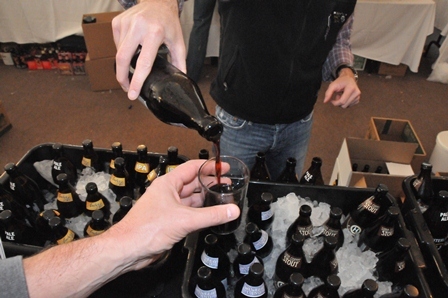 Enjoy unlimited tastings from 35 Midwest craft breweries and distilleries. Entertainment provided by a DJ and photo booth and so more! Grab your souvenir tasting glass and make the rounds to enjoy all this event has to offer. Download the printable Fall Festivals 2018 list here. Baker House, 327 Wrigley Drive, Lake Geneva: The Baker House will be transforming its lakefront garden into a winter wonderland featuring their 6th annual “Fire & Ice Lounge.” Ice Angels will serve fireside drinks in cups made entirely of ice, and for those who prefer something a little less chilly, there will be signature hot toddies. Downtown Lake Geneva: A fantastic FREE family night! Stop downtown between 4 – 7pm to pick up your map, explore downtown, and enjoy many different Pick up a free map and explore downtown, and enjoy a variety of cocoa recipes. Head back at 7pm to vote for your favorite cocoa recipe and have a chance to win fun prizes! During Winterfest, the City of Lake Geneva invites the community and visitors to park their vehicles and ride the FREE shuttle bus downtown. February 6, 2016 8 A.M-8 P.M.
February 7, 2016 8 A.M-8 P.M.
Riviera Ballroom: Entertainment, food, fun and refreshments. Children’s entertainment. Gold sponsors information booths. The Abbey Resort: Enjoy free ATV rides, vintage snowmobile displays, frozen turkey bowling, and ice skating*. Stay and dine at one of The Abbey Resort’s onsite restaurants. Ice skating rentals are available for $2.00 per pair or bring your own and skate* for free. Riviera Park, Lake Geneva: Team judging begins. Riviera Park, Lake Geneva: Vote for your favorite work of art. Ballots and Ballot Box can be found on site. Hawk’s View Golf Club, 7377 Krueger Road, Lake Geneva: Step up to the challenge of Lake Geneva Country Meats’ Chili Cook-Off! Cornerstone Shop & Gallery 214 Broad Street, Lake Geneva: for art and book signings, special guests, treats and refreshments during the store’s Winterfest Open House. View the finished sculptures at Riviera and Flat Iron Parks. Teams return home. For more fun events and activities happening throughout the Lake Geneva area during Winterfest 2016, head over to www.VisitWalworthCounty.com! Can you feel it? Fall is just around the corner. 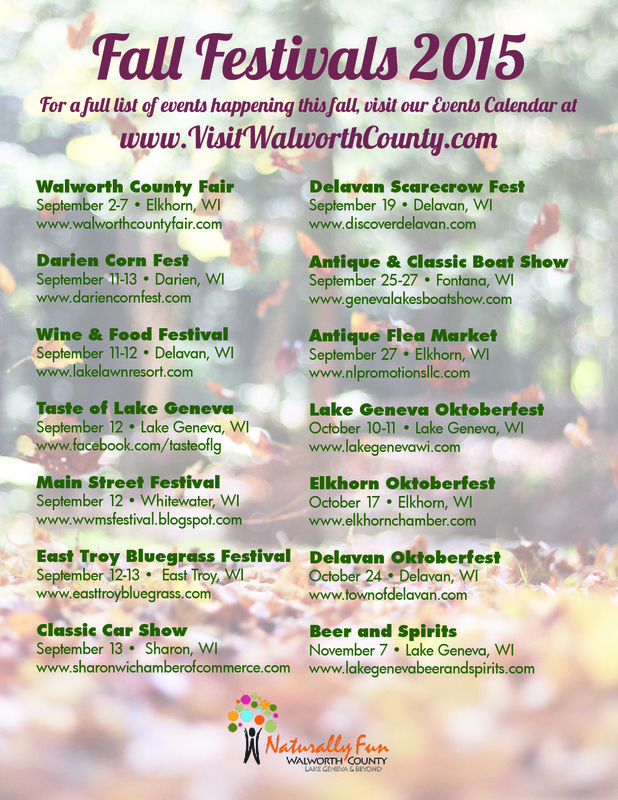 Although we hate to see summer go, we love the great activities and events happening all over Walworth County this fall! The Lake Geneva area is home to some of the best festivals in Wisconsin, and many are happening in the next few months. Grab your calendar & start jotting down dates because these events are ones you don’t want to miss! The fair will be open and filled with fun for the whole family September 2-7. 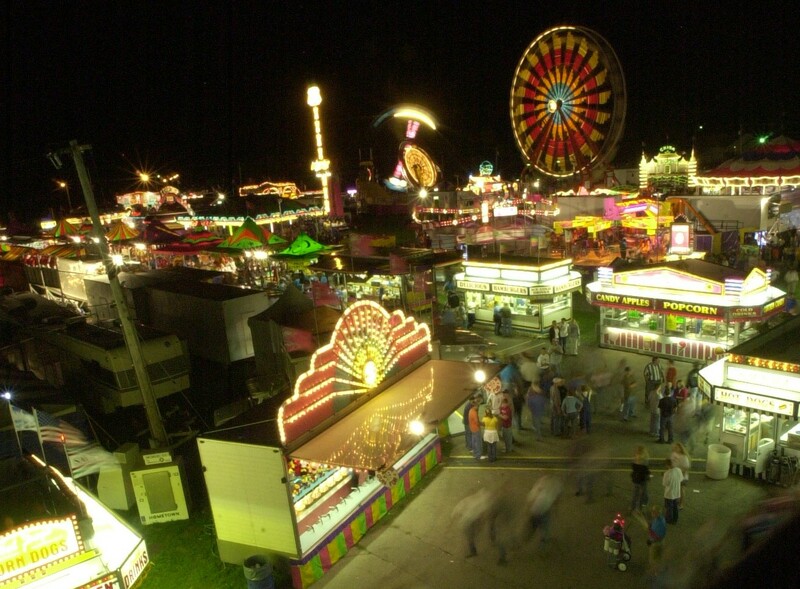 With plenty of excitement at the grandstand (monster trucks, bull riding, demo derbies, plus performances by Charlie Daniels Band and Cheap Trick), plus delicious fair food, carnival rides & games, farm exhibits and more, the Walworth County Fair is known as one of the best county fairs in Wisconsin. This festival is a favorite for young and old alike, featuring free sweet corn from 11 am – 3 pm on Saturday & Sunday. Three days of outstanding live entertainment, volleyball and softball tournaments, bingo, a carnival, fireworks display, food, beer tent, and a parade are just a ‘few’ of the events planned for this weekend! Wine and food enthusiasts will rejoice at this two-day festival! Join the wine dinner on Friday night, or head to the exclusive adults-only event on Saturday from 12-4 pm, which will feature wines from over 25 wineries, plus food samples from top local restaurants – plus informative wine seminars throughout the day. Head to downtown Lake Geneva on Saturday for another great foodie event. From 11 am to 4 pm, the Flat Iron Park will be overflowing with food tents offering tempting treats from the area’s finest dining establishments. Enjoy locally sourced wine from Studio Winery and beer from the Geneva Lake Brewing Company and Sprecher’s Restaurant & Pub! Also enjoy live music from the Triple D Band and the Badger High School jazz band! Visit downtown Whitewater for hands-on art activities, great sales in local stores, live bands, art and craft booths, local foods and many more events all day! The village square in East Troy comes alive with music this weekend, with live bluegrass music all weekend long. Performers include: Front Porch Boys, Sortin’ the Mail, Wood Street Bloodhounds, The Little Roy & Lizzie Show, the Burie Family Band, Georgia Rae, The Seigman Family, Chicken Wire, Mecan River, and Donna Ulisse. Enjoy musical contests, plus great food & marketplace vendors throughout the weekend. Downtown Sharon is the place to be on Sunday, September 13. 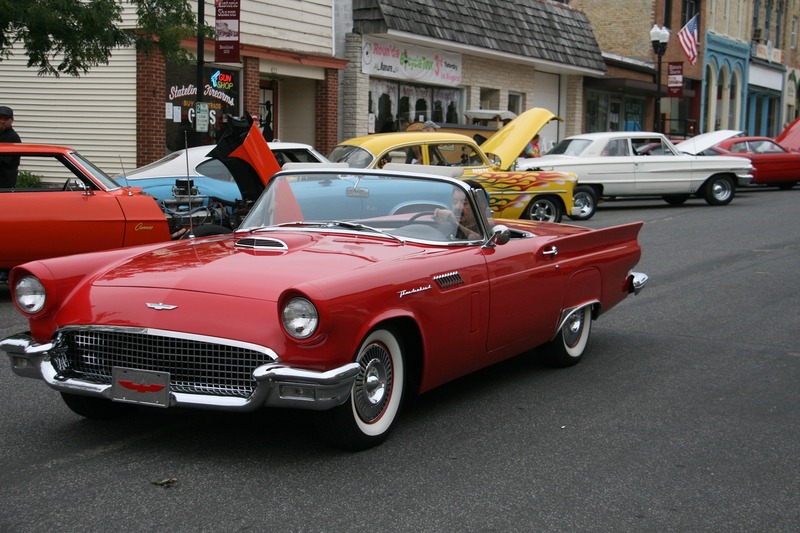 Classic cars from all over will pour into the small Wisconsin town. Enjoy vendors as you walk around to admire the classic & vintage cars. 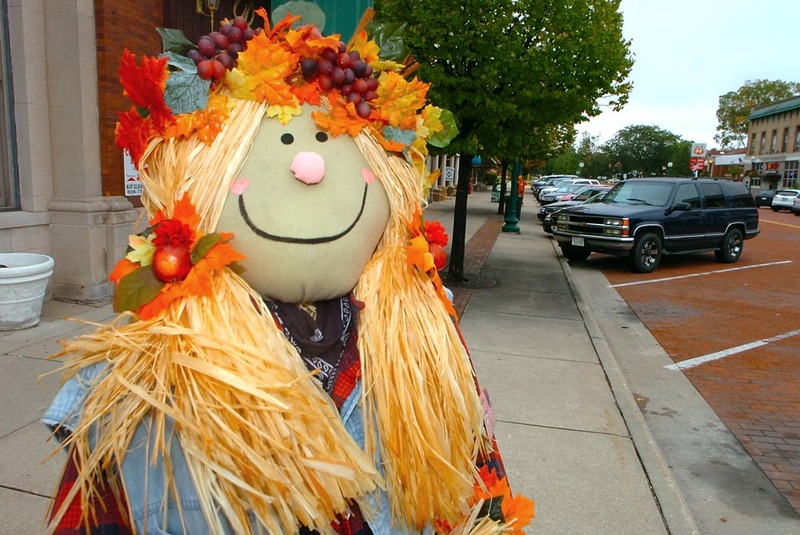 Head to downtown Delavan for the annual Scarecrow Fest. This year’s event will include a carnival, street dancing, delicious food and an Amazing Race! Events and activities are still in the planning stages. Head to the water for the annual Antique & Classic Boat Show, located at the Abbey Resort. The show features antique and classic runabouts, as well as utility, lapstrake, outboard, and Streblow boats; boats are on display throughout the weekend for free public viewing. PLUS – Stop by Saturday at 4 pm for the boat parade on Geneva Lake. The general public is encourage to attend to enjoy the beautiful boats, live music, great food, and local vendors. 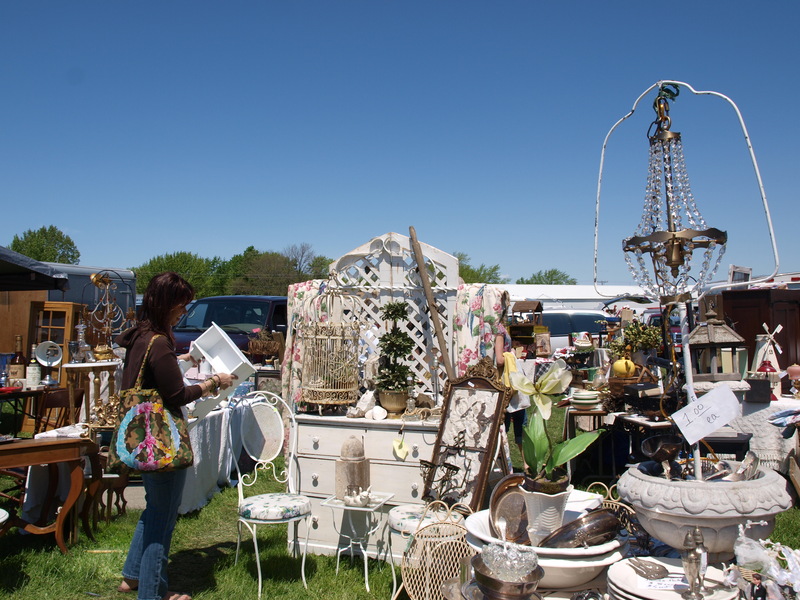 Stop by the Walworth County fairgrounds on Sunday, September 27 for the best flea market around! This is the last 2015 date for the Elkhorn Antique Flea Market, so don’t miss it. Walk around the expansive grounds, featuring over 500 indoor & outdoor dealers. Enjoy great food, paved walkways, and free parking! 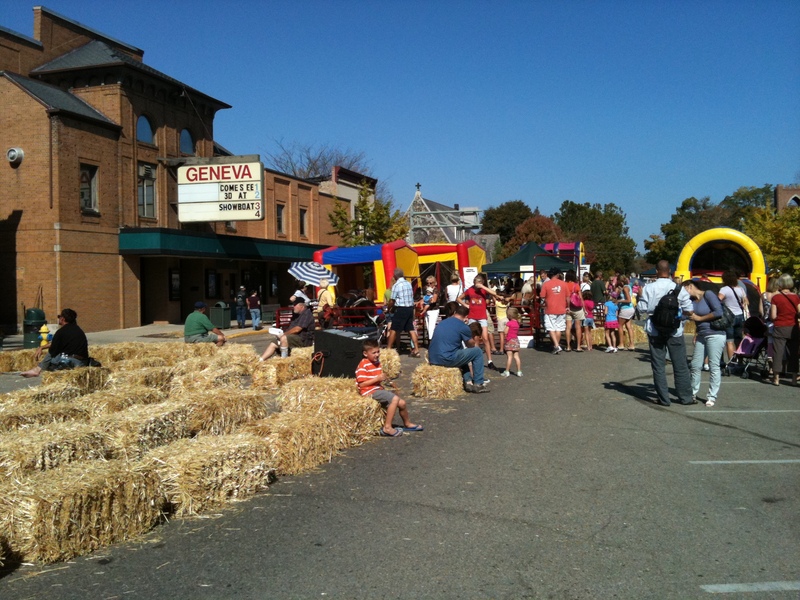 The 24th annual Lake Geneva Oktoberfest will include music, magic, food & craft booths, downtown shopping specials, wagon hayrides, pony rides, bounce houses, and more. The 10th annual Elkhorn Oktoberfest will fill the town square with fall fun for the whole family from 9 am to 5 pm on this autumn Saturday! Peruse the craft fair, the classic car show, food booths, or enjoy live entertainment on the stage. Kids will love the games, pumpkin decorating, bounce house, slides, and more. 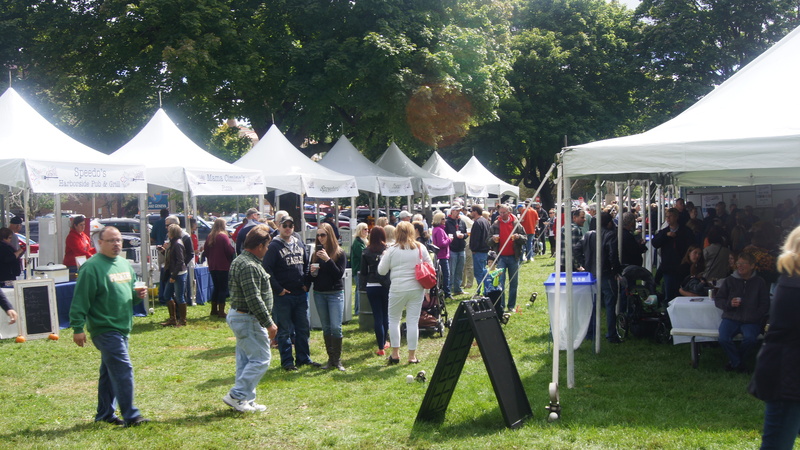 Plus – don’t miss the chili cook-off or the wine & beer tasting tent! Join the town of Delavan at Community Park for another great fall festival, featuring live music, a variety of German foods, beers, wines, pastries, desserts, and vendor booths! There is no charge for this community festival, so bring the whole family down for a fun time! Don’t miss out on the fun! This adults-only festival features “brews, bites, and so much fun…it’s scary.” Guests can enjoy unlimited tastings of beer plus specialty liquors and foods. Live music will be playing throughout the event plus games and fun activities. Not drinking? No problem – they offer a special designated driver ticket that includes unlimited gourmet soda, food sampling, and entertainment. For a full list of the events happening around Walworth County this fall, visit our Events Calendar. For other fun fall activities (like Halloween Haunts, apple orchards, corn mazes, and farm tours), check out our website. Sunday marked the official start of summer – but nothing says summer quite like the 4th of July! Fireworks, dances, parades, festivals, BBQs, and more…all happening right here in the Lake Geneva area! Three days of fun, games & patriotic activities! Enjoy old-fashioned activities, like climbing a greased pole, churning ice cream, a pie-eating contest, egg toss, races, Tofschlagen (hit the pot), parlor games, and tug-o-war. There’s plenty of fun for the whole family – on Friday, enjoy the carnival, the largest beer tent in the area, fair food, a softball tournament, live music, fireworks at dusk, and more! You’re sure to have a grand ol’ time at the Grand Geneva’s celebration. There’s plenty of fun for all ages, with inflatables, face painters, Midway games, a Grand Picnic, entertainment, UW Marching Band & appearance by Bucky Badger, and fireworks….to name “just a few” of the activities! Start your holiday weekend with a BANG at the Star Spangled Celebration. Enjoy food & snacks, live music in the bandshell, kids’ activities, plus the fireworks show at dusk. The fun starts at 5 – with a carnival, live music, beer tent, and food! Mr. Burgundy and Glenn Davis & The Blues Commission are both playing Friday night, plus fireworks at 10 pm. Celebrate all day long in Delavan! Enjoy a pancake breakfast at the fire station in the morning, followed by Carp-O-Rama on Lake Comus at 8. Other activities for the day include a Canoe Regatta, Mill Pond fun, a parade, Phoenix Park demonstrations & activities, live music in the bandshell, and a flag ceremony. The evening concludes with fireworks at Veterans Park over Lake Comus. Three days of fun, games & patriotic activities! Enjoy old-fashioned activities, like climbing a greased pole, churning ice cream, a pie-eating contest, egg toss, races, Tofschlagen (hit the pot), parlor games, and tug-o-war. On Saturday, the Grand Parade through the 1880s village begins at 1:30 pm and features people, animals, and the Harmony Cornet Band. 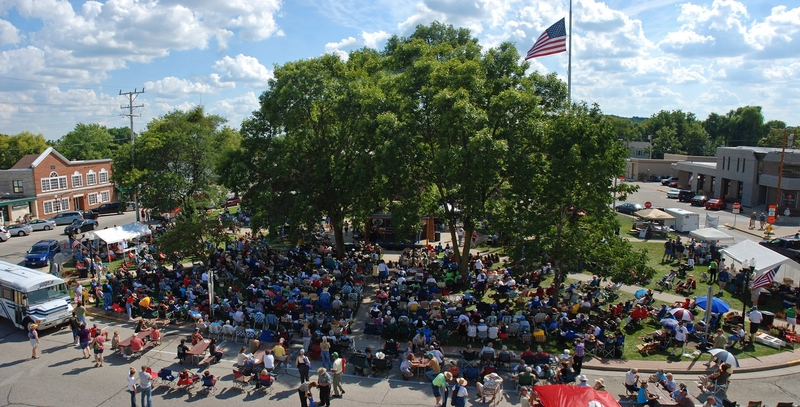 The downtown parades kicks the festivities off, followed by the annual Whippet City Mile Run, a car & bike rally, Minneiska Ski Show, carnival rides, and live music. The night concludes with a SECOND night of fireworks at 10! Resort guests and locals are all invited to join the fun at The Abbey Resort. Harbor Lawn will be bustling with activities like inflatables, basketball, an obstacle course, face painting, a cookout, and fireworks at dusk. Enjoy live entertainment throughout the resort in the evening. Enjoy fun activities, a parade through downtown, food, & music in downtown Sharon for their 4th of July celebration all day long. The festivities continue at the East Troy 4th of July Celebration! Guests can enjoy a Kiddie Parade, softball tournament, wrist wrestling, dart tournament, a car show, carnival, truck & tractor pulls, and live music on Saturday. Celebrate in Bloomfield/Pell Lake, with a parade, food, activities, and fireworks at dusk. 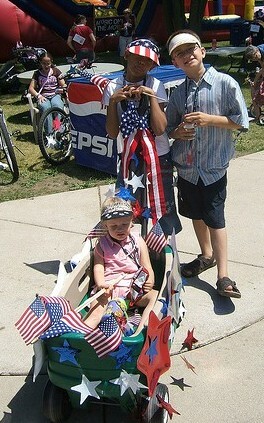 Kids are welcome to decorate their bikes and join the parade! It’s fun for the whole family at Lake Lawn, with a cook-out, kickball, laser tag, sand volleyball, games, a kids’ zone, and fireworks over the lake! The red, white & barbecue heats up at 5, with grilled goodies in the pavilion. Kids will love the inflatables and kids’ activities – and everyone can enjoy live entertainment plus the fireworks over Lake Como. PLUS: Geneva National Foundation will be selling glow necklaces, to benefit the disabled of Walworth County. Look for the table – or the kids with Geneva National Foundation shirts on! The festivities continue on Sunday at the East Troy 4th of July Celebration! Enjoy the area’s largest parade, live music, carnival rides, and the annual East Troy Lions ETBT Ride! Enjoy carnival rides, food, and a beer tent – plus pedal pulls and a petting zoo for the kids! If you’re looking for even more fun in the area, check out our Events Calendar. Ring in the New Year in the Lake Geneva Area! 2015 is just around the corner, but before it comes – we’re celebrating 2014 in a big way! 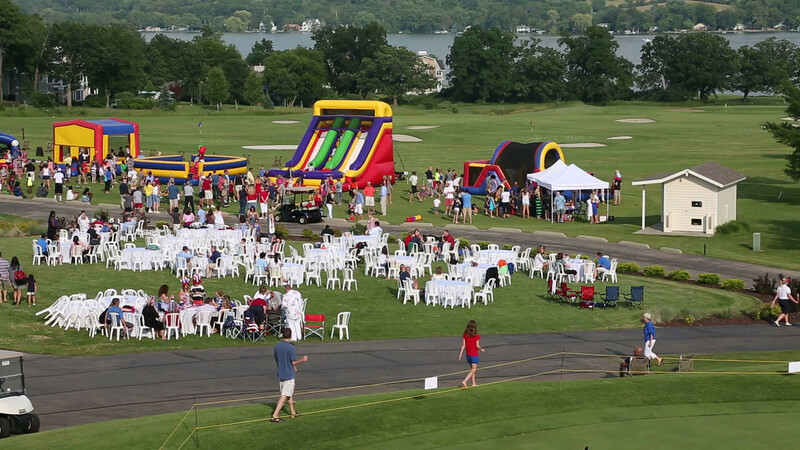 We have celebrations happening all over the area, so whether you’re looking for a nice dinner, a fun family festival, a themed party, or an all-night affair, look no further than the Lake Geneva area! This teen/tweens New Year’s Party (ages 6-17) will keep your kids dancing the night away, starting at 7 pm! The party includes arcade-style video games, DJ & Karaoke, face painting, tattoo artists, two all-night movie theatres, and more…for just $45 per person! Available for those spending the night at Lake Lawn, the Family Celebration will offer a light up dance floor, party favors, a midnight balloon drop, and family toast! Join the Black Sheep for one of three set times (5 pm, 6:40 pm, 8:20 pm) for a delicious five-course dinner. The meal is just $35 per person; add on a cocktail package now for just $15 per person – or $18 at the door. Reservations are required. Menu is available at the link. Seatings are available at 5 pm and 7 pm, and reservations are required. Celebrate the New Year with a view at Grandview! Enjoy Happy Hour from 4-6 pm and Dinner from 5-10 pm. Enjoy a special three-course dinner for just $65 per person, or a limited version of the regular menu will be offered as well. Indulge in a five-course meal for just $60 per person, complete with craft cocktail specials and a complimentary champagne toast with your meal. Seating begins at 5 pm and continues until 10 pm; reservations are required. Click to see this mouth-watering menu. They will have a special menu, including a Prime Rib Dinner (12 oz for $22, 18 oz for $26), Jumbo Lobster Tail, Regular Lobster Tail, Surf N Turf, and more! Dinner is served 4-10 pm. Celebrate New Year’s at Alpine Valley Resort, with The Orphans playing 10 pm – 1 am. Enjoy party favors & a midnight champagne toast! From 4-8 pm, Studio Winery will have Glenn Davis & Friends playing live blues music. At 7 pm, ring in the New Year with the people of Reykjavik Iceland! Celebrate at The Abbey – enjoy a four-course dinner at 240 West from 6-10 pm. When dining at 240 West, you’ll receive the exclusive option to purchase a Party Pass for the New Year’s Eve Gala or The Waterfront Party for just $35! OR…party at the New Year’s Eve Gala (in the Harbor Ballroom) starting at 6:30 pm with a four-course dinner, open bar, live entertainment, champagne toast, and balloon drop at midnight. The Waterfront Party starts at 9 pm in the The Waterfront and features an open bar, live music, a champagne toast, balloon drop & late night appetizer buffet for just $79 per person. Turn back the clock at the Baker House, 1920s Parisian supper club style! Seatings are available from 6-10 pm, and entertainment continues until 12:30 am. Enjoy a four-course meal, champagne cocktail, and Parisian Cabaret Music by Claudia Hommel – all for just $65 per guest. Reservations are required. The New Year’s Eve buffet will be served in Lakeview Grille 5-9pm and is just $44.95 per adult and $16.95 per child. Reservations are strongly recommended for the buffet. Live music will be playing in the Lakeview Grille from 5-10 pm and in the Lakeview Lounge from 9 pm – 1 am. Stay overnight & enjoy a New Year’s Day brunch on Thursday, starting at 9 am. The Boat House is ushering in 2015 in style! Dinner service begins at 5 pm, and stay for a fun night starting with the NYE drink package beginning at 9:30 pm! The DJ and dancing will start at 10:30 pm and continue until close, with a complimentary champagne toast at midnight. Dining available at Grand Cafe, Ristorante Brissago, and Geneva Chophouse – but reservations are required. Enjoy a DJ, champagne toast, party favors, lakeside fireworks display & a cash bar at the Deja Vu Party in the Grand Ballroom, starting at 8 pm for $15/person. Dine from 5-10:30 pm, and choose from a variety of appetizers, salads, entrees, & dessert on a delicious prixe fixe dinner menu ($55/person). Call now for reservations. 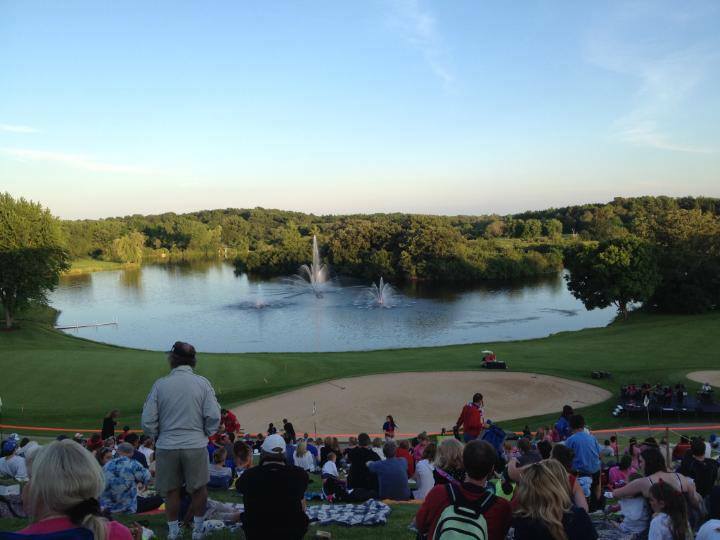 PLUS – the Lake Geneva House of Music will perform from 8 pm – 1 am, with a cash bar available. Spend the night at Lake Lawn, and you’ll gain access to their Italian Buffet, Family Celebration & the all-night party! For just $50 per person, you can get into the Monte Carlo Room party – with appetizers, dinner, and dancing starting at 6 pm! Enjoy party favors, a champagne toast, ball drop, late-night snacks, dance music, and a cash bar. 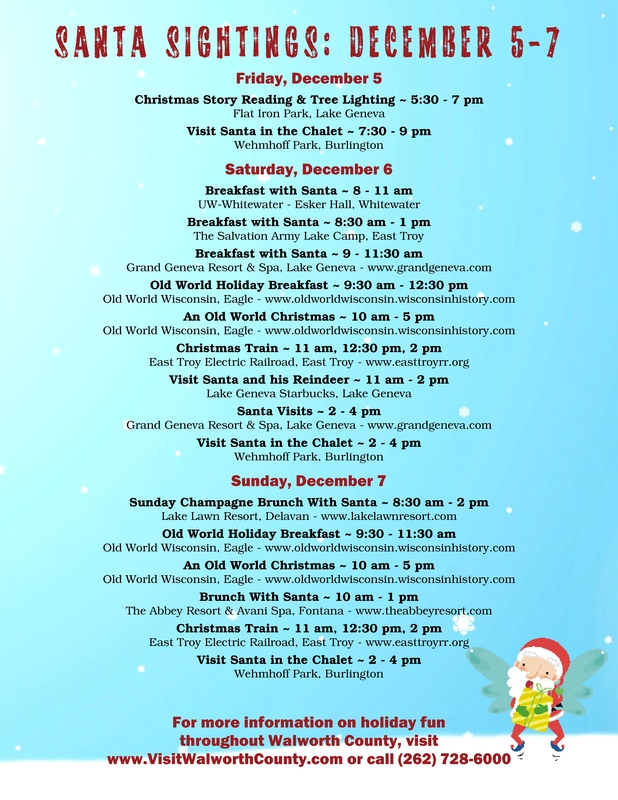 Santa has a very busy weekend ahead, with stops all over the Lake Geneva area! In addition to his appearances in local parades (click here for a list of the Walworth County parade dates and times), Santa has breakfasts, brunches, train rides, and more. For a full list of Santa sightings and holiday events, visit our Events Calendar, and check back here next weekend for the latest in Santa Sightings!